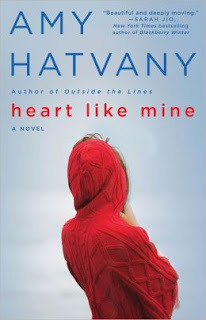 "Heart Like Mine" by Amy Hatvany ~ Exceptional Story! From rising star Amy Hatvany, an engrossing new novel about a woman whose life is turned upside down when the man she's engaged to suddenly becomes a full-time father to the children from his previous marriage. Amy was born in Seattle, WA in 1972, the youngest of three children. She graduated from Western Washington University in 1994 with a degree in Sociology only to discover most sociologists are unemployed. Soon followed a variety of jobs – some of which she loved, like decorating wedding cakes; others which she merely tolerated, like receptionist. In 1998, Amy finally decided to sell her car, quit her job, and take a chance on writing books. Amy spends most of her time today with her second and final husband, Stephan. (Seriously, if this one doesn’t work out, she’s done, kaput, no more husbands.) She stays busy with her two children, Scarlett and Miles, and her “bonus child,” Anna. Their blended family also includes two four-legged hairy children, commonly known as Black Lab mutts, Kenda and Dolcé. I really wanted to review "Heart Like Mine" so much and was delighted to be able to get a reader's copy recently. It was burning a hole in my coffee table all through the Christmas holidays as I was dying for the opportune time to pick it up for a good read. Well worth the wait, I'm here to report to you! Amy Hatvany is one of the best of the contemporary women writers of today, in my humble opinion. She knows how to translate women's issues and to bring them to the forefront through believable and endearing characters, both female and male...and those of all ages. She is a chronicler of our times, I think, in her assessment of what goes on in the contemporary family and in the minds of those mothers who are dealing with them. She has her hand on the pulse of women in crises and she can tell you about them so that you feel their angst and their push-pull of emotions. If, as so many authors believe, characterization is the thing that makes a book great, "Heart Like Mine" is a great book! It is a gripping novel from the first sentences and it holds on 'til the last. This is one you won't soon forget, with women you'll be thinking about for days after you put the book down. A perfect book for book group reading! Can't wait to get mine! I know she has captured me before, and I expect she will again.